(Nanowerk News) A simple retinal prosthesis is being developed in collaboration between Tel Aviv University in Israel and Linköping University in Sweden. Fabricated using cheap and widely-available organic pigments used in printing inks and cosmetics, it consists of tiny pixels like a digital camera sensor on a nanometric scale. 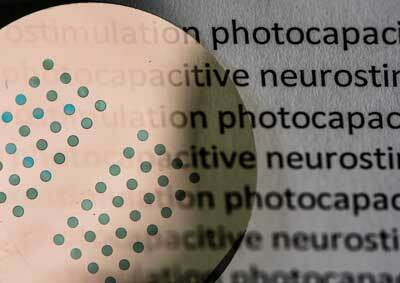 Researchers hope that it can restore sight to blind people. Researchers led by Eric Glowacki, principal investigator of the organic nanocrystals subgroup in the Laboratory of Organic Electronics, Linköping University, have developed a tiny, simple photoactive film that converts light impulses into electrical signals. These signals in turn stimulate neurons (nerve cells). The research group has chosen to focus on a particularly pressing application, artificial retinas that may in the future restore sight to blind people. The Swedish team, specializing in nanomaterials and electronic devices, worked together with researchers in Israel, Italy and Austria to optimise the technology. Experiments in vision restoration were carried out by the group of Yael Hanein at Tel Aviv University in Israel. Yael Hanein’s group is a world-leader in the interface between electronics and the nervous system. The results have recently been published in Advanced Materials ("Direct electrical neurostimulation with organic pigment photocapacitors"). Eric Glowacki and his research group work at the Laboratory of Organic Electronics in Norrkoping, Sweden. The research group is part of a larger research initiative called the Wallenberg Center for Molecular Medicine, WCMM, at Linköping University. This initiative has created the unique environment necessary to develop this technology in a collaboration between nanomaterials scientists, biomedical engineers, and biologists.